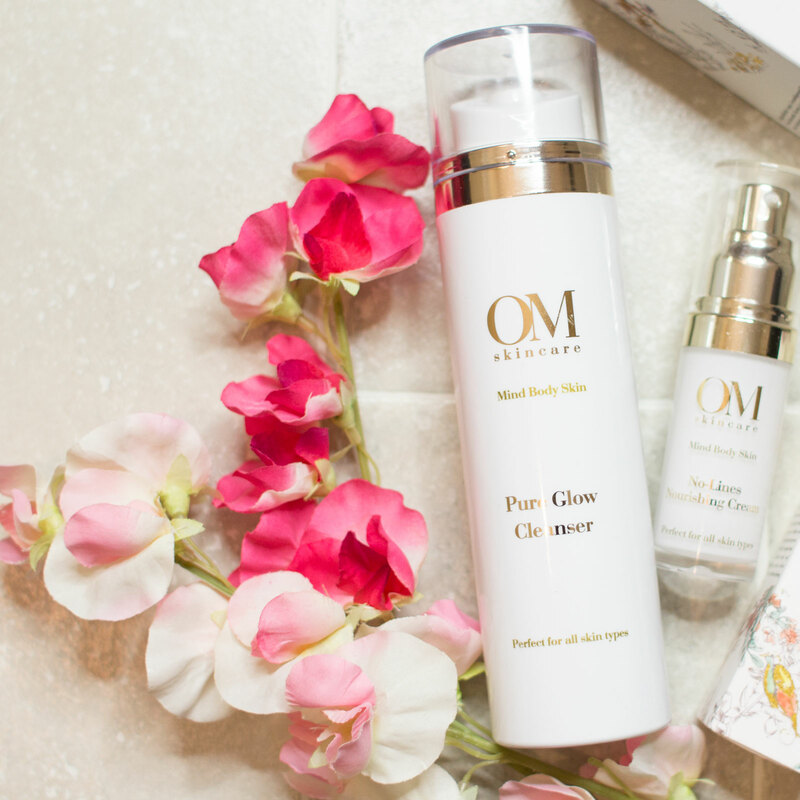 Om Skincare describes Om Skincare Pure Glow Cleanser as a gentle and deeply nourishing cleanser that doubles up as a make-up remover and deep cleansing treatment. It is formulated with Organic Aloe Vera, gentle extracts of Rosewood, and Sweet Orange extract to increase the production of collagen in the skin. Suitable for all skin types, balancing oily skin whilst re-hydrating dry skin. Used with lukewarm water, this gel cleanser lathers moderately on the skin. On my combination skin, its one of those cleansers that leaves your skin feeling 'tight' and 'squeaky clean'. I find I have to reach out for my creams soon after using to get back some moisture. Compared to micellar water cleansers, it is not so good at removing make up, especially eye makeup. I would use this as a second cleanser at night and as the first one in the morning after waking. After a week of use, I am happy to report it is not comedogenic. I would recommend Om Skincare Pure Glow Cleanser to individuals with normal to oily skin. I would avoid using this on dry, open, sensitive, eczematous skin as it has the potential to irritate. I perhaps wont repurchase this myself as I tend to go for milky cleansers as opposed to the more-drying gel-based ones. 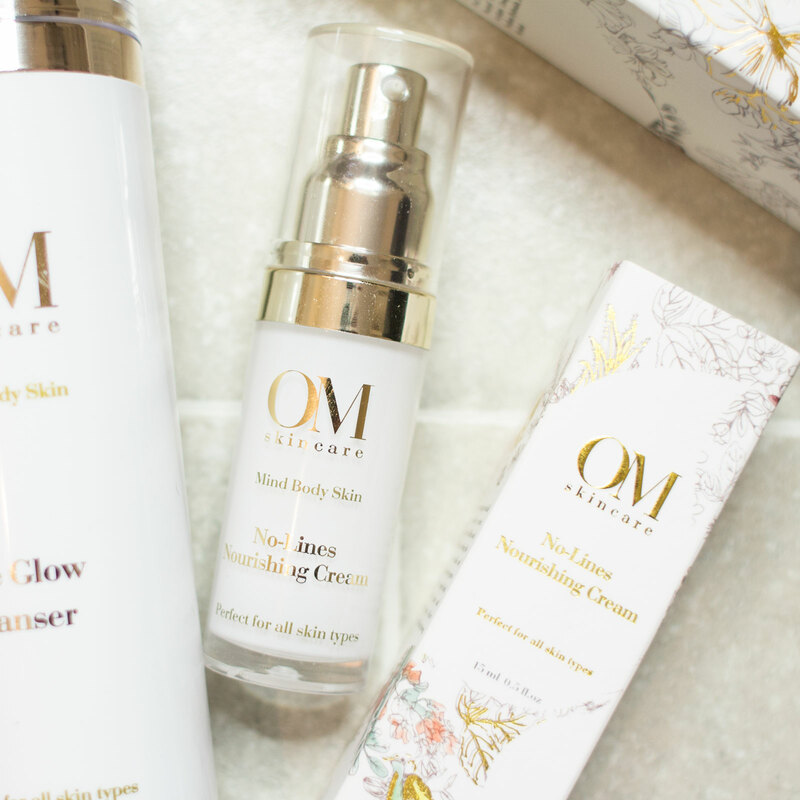 Have you tried Om Skincare? Om Skincare No-Lines Nourishing Cream is a lightweight cream intended to fill in lines and wrinkles. Om Skincare suggests using this as an eye cream, on the nasolabial folds and forehead wrinkles as desired. It contains hyaluronic acid, seaweed, dill seed extract, witch hazel and soybean protein which act to firm and tighten skin. It comes in such beautiful white and gold packaging that instantly lights up my dressing table. It comes in a handy sanitary pump dispenser with 15ml of product. Half a pump is sufficient to apply around both eyes. To use, I would suggest applying on to clean skin with tapping motions, while avoiding dragging on the skin. It absorbs within 10 minutes and keeps the skin nourished for hours. I would apply makeup around the 15-minute mark. 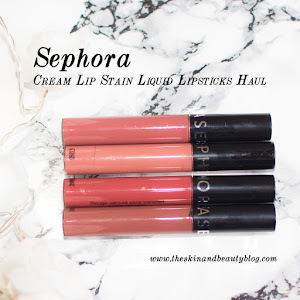 It works well as a makeup base and does not clump concealers. With regards to undereye circles, there's a tightening and brightening effect that lasts for a few hours. I feel I do not have to apply undereye concealer when I use this. As for wrinkle treatment, I am fortunate not to have many yet, so this is difficult to tell. It feels like it would work well for wrinkle prevention. I think this is works for individuals with normal to combination skin, and for those who have existing wrinkles or those who would like to prevent them. I would avoid using this on dry, open, sensitive, eczematous skin as some of the ingredients eg. witch hazel have a potential to irritate and inflame. Overall I do like Om Skincare No-Lines Nourishing Cream (£55) as an eye cream and generally would recommend it. It will take me a few months to finish, we'll see if I would repurchase then. I never used to look twice at volumising products - infact with a 'mane' of thick black hair, frizz and dullness were my main hair woes. Recently I found my hair looking more flat at the roots and definitely some well needed refreshing in between washes with my busy work schedule. Time to put it the test! The Swell Ultimate Volume 3-Step Kit contains a shampoo, conditioner and root spray. The slogan of this company if definitely 'less is more' and a small amount if definitely all you need. It smells incredible and is completely vegan and paraben free. The 3 step kit comes with a booklet packed with tips and advice. I personally have to say the root spray is definitely the winner in this trio. I have seen a definite improvement in the roots giving really noticeable volume when I spray this to my roots before blow drying my hair. Step 1- Shake bottle before use and during use.Step 2- Focusing on the roots, gently pump to ensure fine powder application. Step 3- Run hands through hair distribute product.Step 4- Repeat as necessary. After trying this product for a few weeks I can definitely recommend these products. They give a noticeable difference even after the first use and they make a great stocking filler this time of year! If you follow us on Instagram you'll know I absolutely loved the Vitamasques sheet mask - so hydrating and moisturising. Masks were always something I had just seen in old movies of girls using pre-prom but these last few weeks I've really being enjoying discovering some new masks especially for my extra dry skin! The first is the De-Stressed mask from True North. I cannot rave about this enough. It contains Aloe Vera and advises to apply a generously layer onto a cleansed face and neck. I have been using this after work non-stop lately as it is so rich and hydrating and dissolves away any tension headache I have. It definitely soaks into my skin and leaves it feeling softer and hydrated. 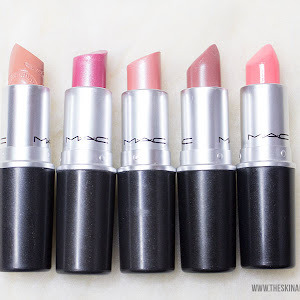 The packaging is so cute and the only down side would be the slightly small size and the fact that it is quite pricey - however, a little goes a long way with this product and I find that lathering excess on is not needed. It is available from Harvey Nichols for £59. The Elizabeth Arden PRO illuminating enzyme masque is another favourite. This mask is also rich and creamy and smells incredible. It contains papaya, pumpkin, pineapple and black willow bark extracts. I kid you not - it smells so good to the point you may want to eat it! (But seriously don't...) I have been loving to use this to prep my skin a few hours before doing my makeup for an event and as of yet has not failed me! Check it out for yourself! 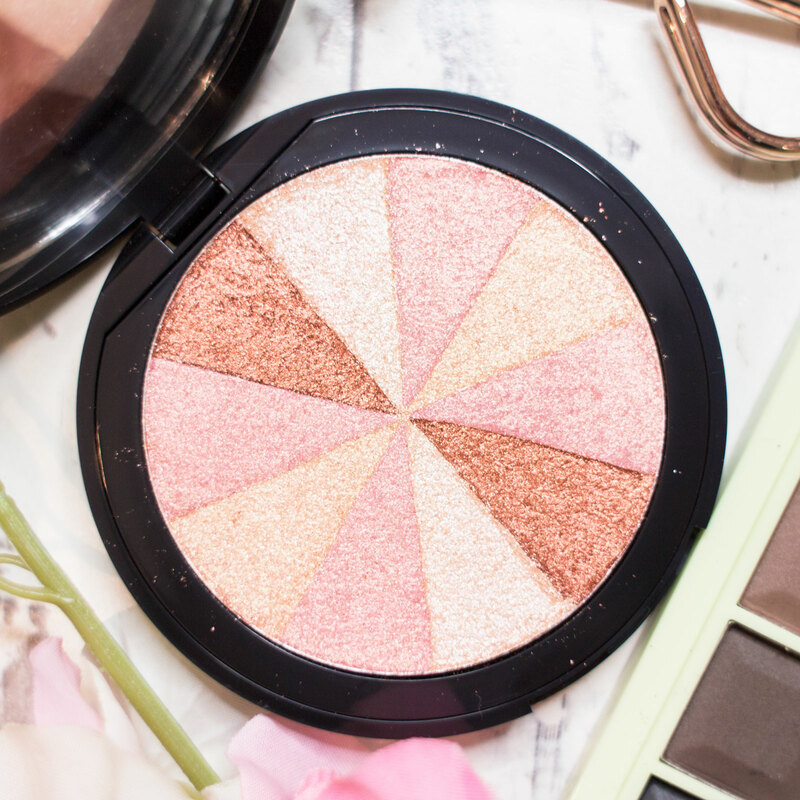 I recently received this gorgeous Soap and Glory Peach Party Multi-Colour Blush Brick from Shivanee. She only knows too well my fondness for the colour peach. 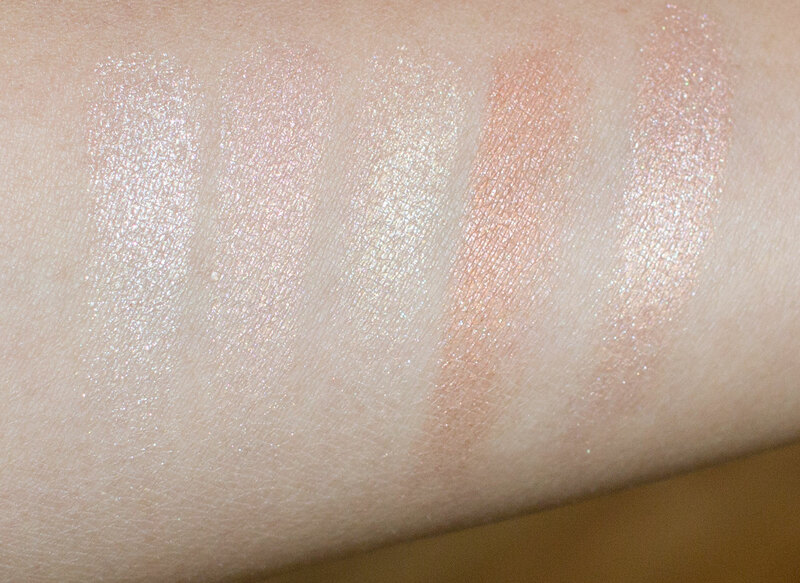 Soap and Glory Peach Party Multi-Colour Blush Brick is a beautiful shimmery wheel of peach tinted shades, from a pale white gold to a medium toned peach copper colour. Swirled together, it makes a gorgeous glow. 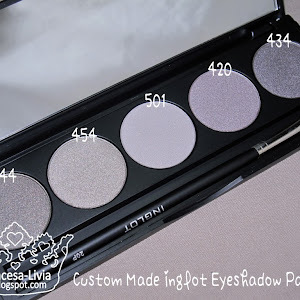 The shades are accessible individually with small fingertips or a delicate eyeshadow brush. 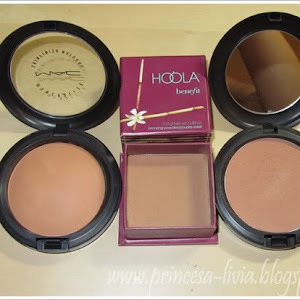 You can use them separately as highlighter or as a shimmery lid/browbone shade if you like. Mix and match; the possibilities are endless! If used on the eyes, I would suggest using a primer underneath to make it stick. 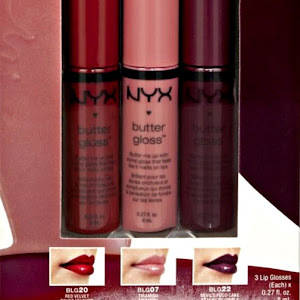 It is well pigmented, but you can easily pack it on if you like. 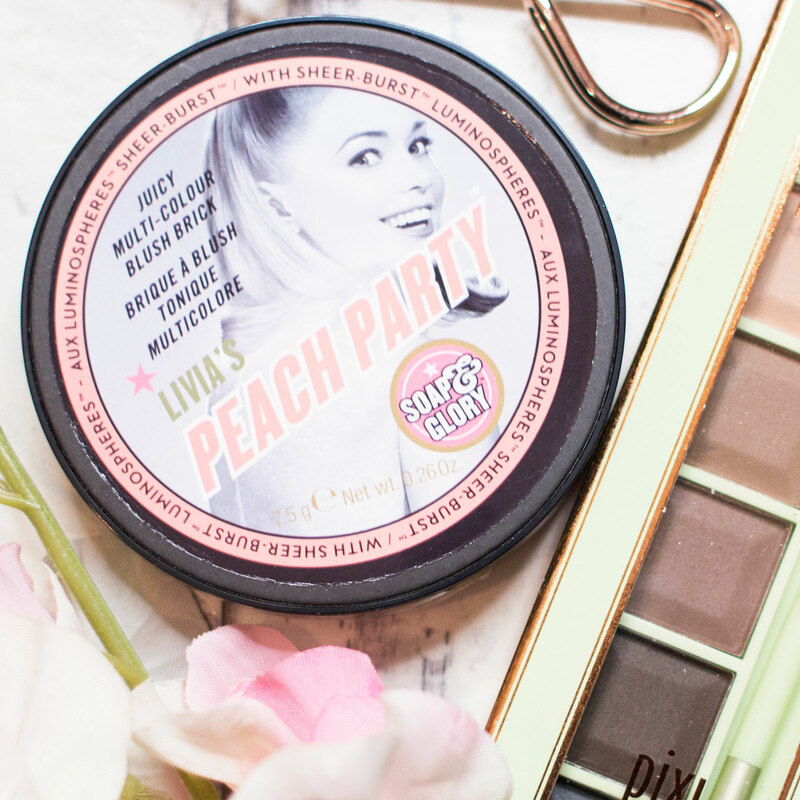 Overall, I love this Soap and Glory Peach Party Multi-Colour Blush Brick and I would recommend it as a cheaper alternative to the Bobbi Brown Shimmer Bricks. It makes a perfect highlighter for the holiday season, and would make a wonderful gift. If you are able to get one with loved one's name on it like my blush brick has (thanks Shiv! ), even better! Decades of fruit juice, fizzy drinks, previous tooth whitening and nocturnal tooth grinding have unfortunately taken a toll on my teeth making them super sensitive. I have heard of the tooth-protecting effects of Sensodyne and upon trying their products, I have remained loyal to this brand for years since. Enamel is the white, mineral rich outer layer of our teeth that protects the sensitive bony dentin underneath. If your enamel is thick and healthy then it gives you a strong white smile. However, over time acidic foods and drinks can erode the enamel and expose the yellow and dull dentin underneath. If your teeth become sensitive, appear yellow, dull and thin, then it could be a sign of weakened or acid softened enamel. Acid erosion is caused by frequent eating and drinking sugary acidic food and drink, such as fruit juice, fizzy drinks, alcohol, and even coffee and salad dressings. If your diet is healthy then don’t change it. As long as your enamel is protected every day, then there's no reason why you can't enjoy acidic foods and drinks as part of a healthy diet, as well as healthy strong enamel. Once enamel’s gone, it’s gone forever. If you are like me, with sensitive teeth, you may benefit from the Sensodyne Pronamel Range. Sensodyne Pronamel Mouthwash and Toothpaste* are recommended by Dentists due to their unique optimised fluoride formulations that actively strengthen weakened enamel. Pronamel toothpaste also helps to prevent further enamel from dissolving. The toothpaste and mouthwash have each also been specially designed for people at risk of Acid Wear. 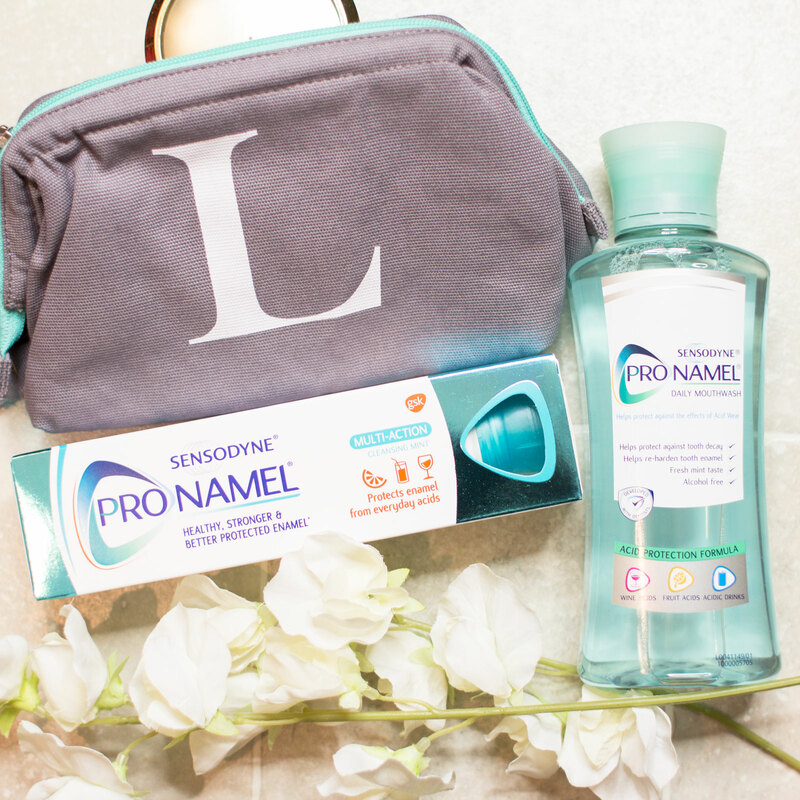 With Pronamel, minerals penetrate deep into the enamel surface, actively strengthening and re-hardening weakened enamel making it healthy, stronger and better protected from the effects of acids - every day. It's no surprise I recommend Sensodyne Pronamel. 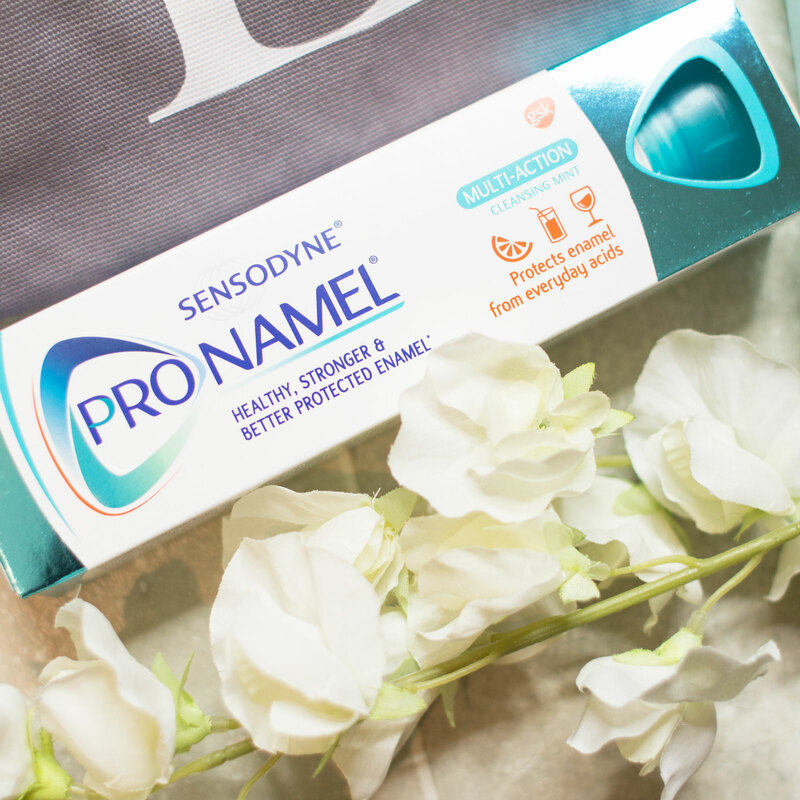 Come and join me on the Sensodyne Pronamel bandwagon! I have never been one to really wear false lashes. Apart for the occasional black tie event I have always preferred mascara. I found the lashes I had tried before had too thick bands making them look too unnatural and being inexperienced - very messy to handle! 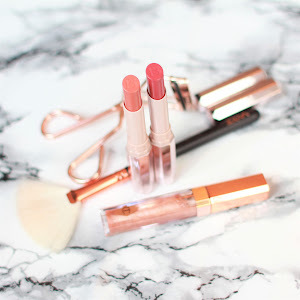 Over the last few days I have been testing out some beautiful lashes sent to me by falseeyelashes.co.uk and I have to say I am in love and I am definitely going to be wearing more false lashes in the future. 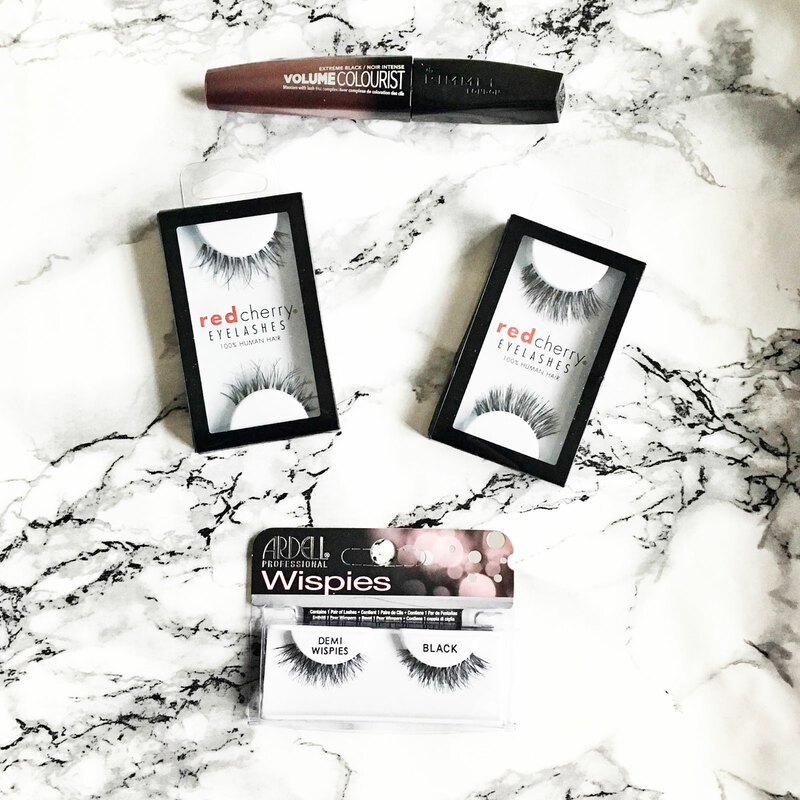 The Red Cherry lashes are my favourite. The band is so thin and (after a bit of practice!) are so easy to apply. The thin band enables a really natural looking false lash that still can be exaggerated with the addition of mascara and liner. The Wispy #WSP are absolutely stunning and I think these will definitely be my go-to lashes from now on. 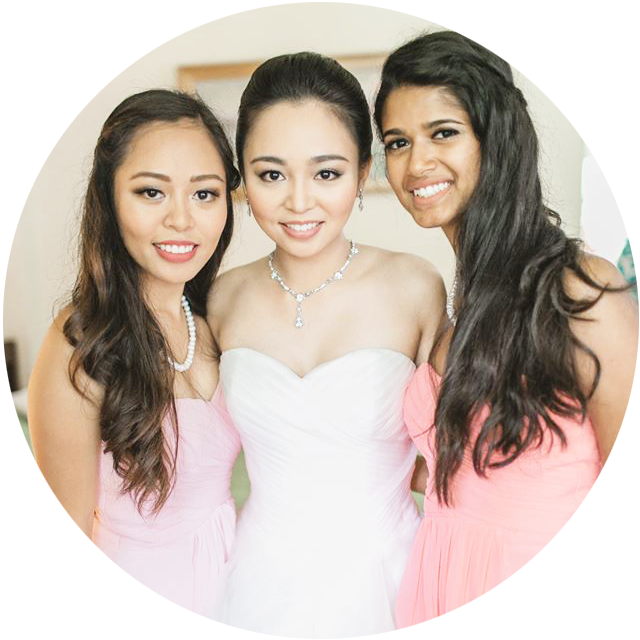 They have beautiful cross lashes giving a very pretty look. I got so many compliments with the lashes and wore them for a good 15-16 hours at beautycon, dinner and drinks and most of the time forgot I was even wearing them! (Yes they were that good) at the end of the night they still held beautifully in place and were not irritating my skin/eyes. The Ardell Demi Wispies are definitely a cult favourite. I agree that they are flattering but I personally found them to be slightly heavy on the outer 1/3rd of the lash and with little extra volume. I found my lashes pre-mascara were almost coming to the edge. They are still beautiful lashes especially if you want a bit of volume and have shorter lashes naturally. I also tested out the Rimmel Volume Colourist mascara in extreme black. This has been a favourite of mine in the past and has been great to rediscover. Plastic wands are my favourite in general and this mascara definitely does a good job of really separating the lashes whilst adding volume. 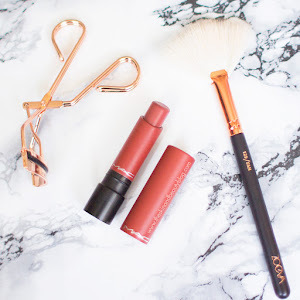 Great to use with these lashes! The only drawback is the chunkiness of the lid which makes application very slightly more difficult. All in all I would 100% recommend these lashes. falseeyelashes.co.uk is a great new company stocking so many different lash brands as well as mascara. There is no minimum spend for delivery which is great and I on google searching their prices are extremely competitive retailing for these lashes at just £3.99! They are also stocking the Morphe brushes coveted 35o palette - I must admit, I may be first in line to grab that when it is back in stock! And of course - more lashes! I love multivitamins. A single pill provides a surplus of vitamins to get you through the day. Taken daily, you replenish your stores and energising effects last longer. However for good health, multivitamins aren't enough. Studies have shown other substances such as omega 3, co-enzyme Q10 and green tea can provide energy and great healthy skin. 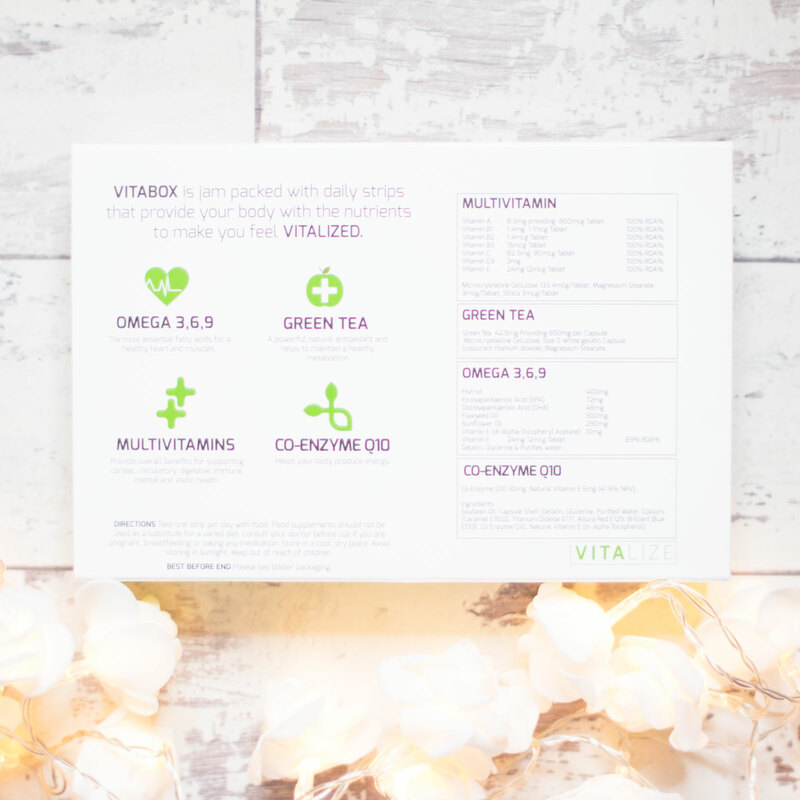 Enter the Vitalize Vitabox*. Your one stop pill box for healthy skin. 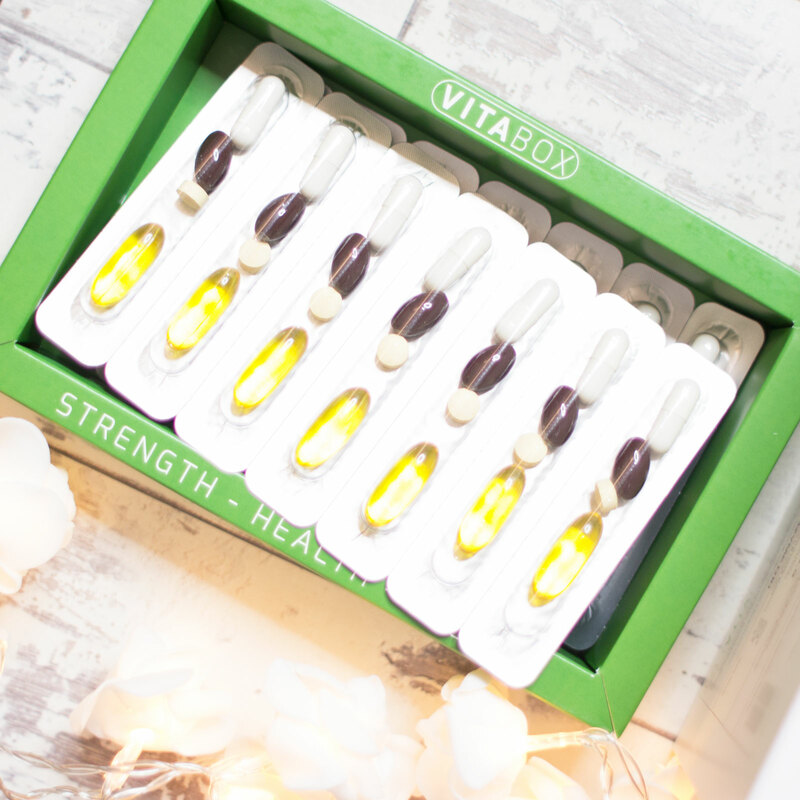 The Vitabox* contains essential vitamins (A, B1-3, C, D3 and E) as well as Omega 3,6,9 (for a healthy heart), Co-enzyme Q10 (a natural energiser) and Green Tea (a powerful anti-oxidant). They come in nifty labelled blister strips to retain freshness and safe dosing. You don't have to remember whether you've taken it or not, as long as you take one strip a day. Prior to the Vitabox*, I've been using the Holland & Barrett Cod Liver Oil with Multi Vitamins Capsules, which contained Vitamins A, B1-3, B6, B12, C, D, E and Omega 3. I found that even it was a single pill, it was difficult to ingest and because of that I would go for days without taking it. I was surprised that although slightly larger, the Vitabox* pills were not difficult at all. The only downside as there are four, but all go down easily with a single glass of water. One thing to reiterate is that Vitamins are no substitute for a healthy diet. You must take these with a meal. This would roughly set you back £31 per month. 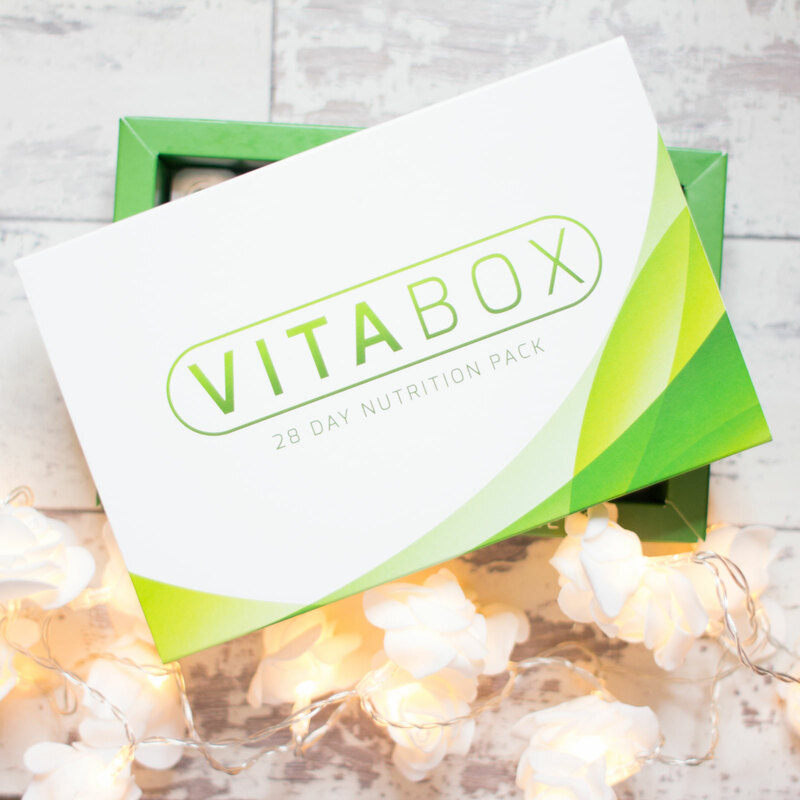 The Vitabox costs £25.99 per month (subscription), or £28.99 for a one month box, which is £2-6 cheaper than if each component was bought separately. 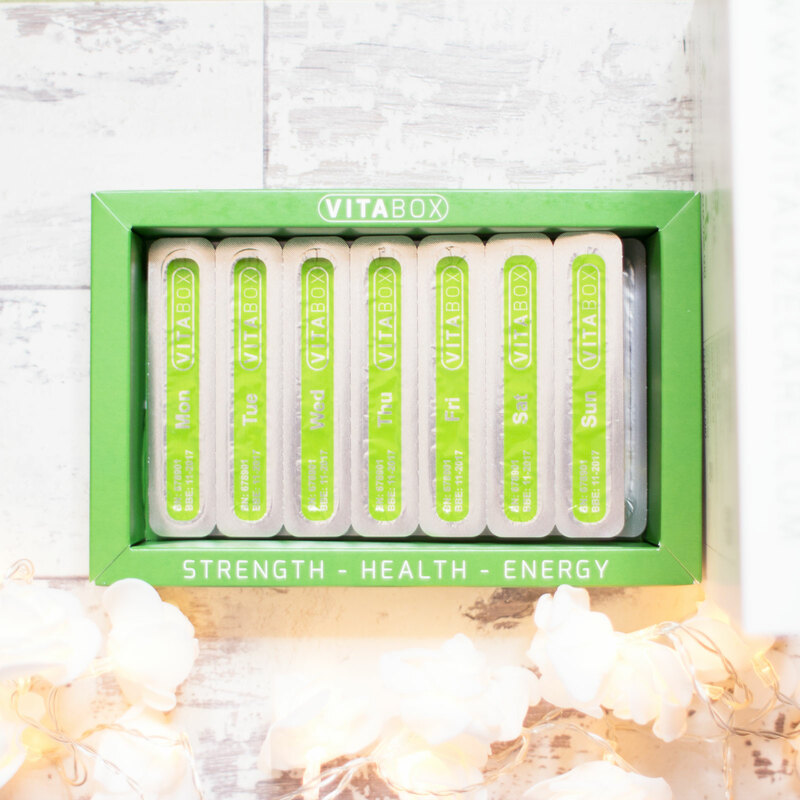 Overall, I would recommend the Vitabox* to anyone looking for an energising pill box that is also good for your skin. You can purchase this from Vitalizecare.co.uk. 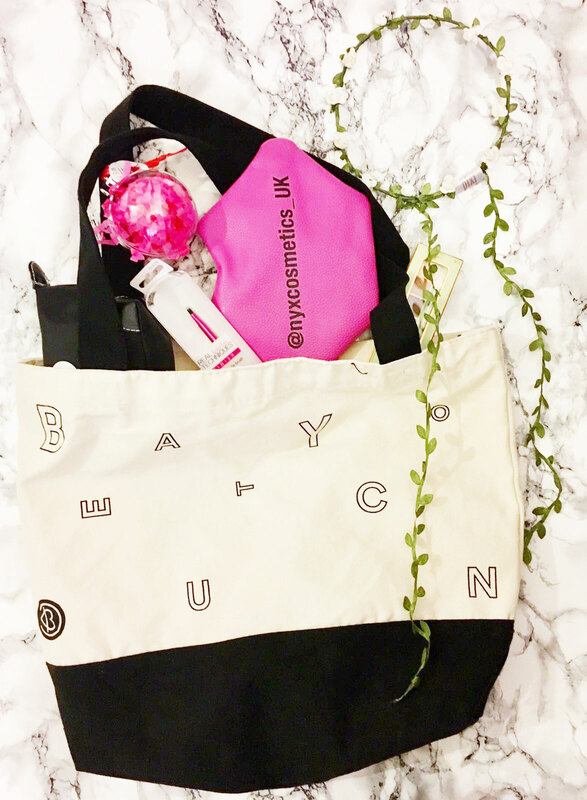 I was so excited to attend Beautycon London this year - it was a packed day, packed with even more wonderful beauty products! I had heard good things about the convention last year - which I believe was the first time in London and it this time round they stepped things up making it bigger and better. I purchased the Hauler package which enabled me to enter 2 hours early (10am) and gave a tote stuffed with goodies!! 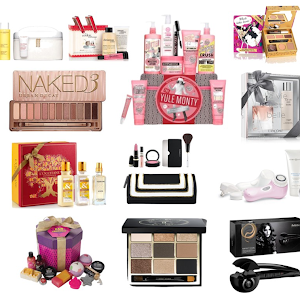 It was held at the Kensington Olympia and filled with stalls from NYX, Pixi, Soap & Glory, Lime crime amongst others. I was eager to rush around them all as many brands were giving freebies (most linked with a social media upload) and had sweets, fun photo booths and lots of great products to browse and buy. One of my favourite stalls was the Beauty bay stall - filled with American brand products in their 'playground'. 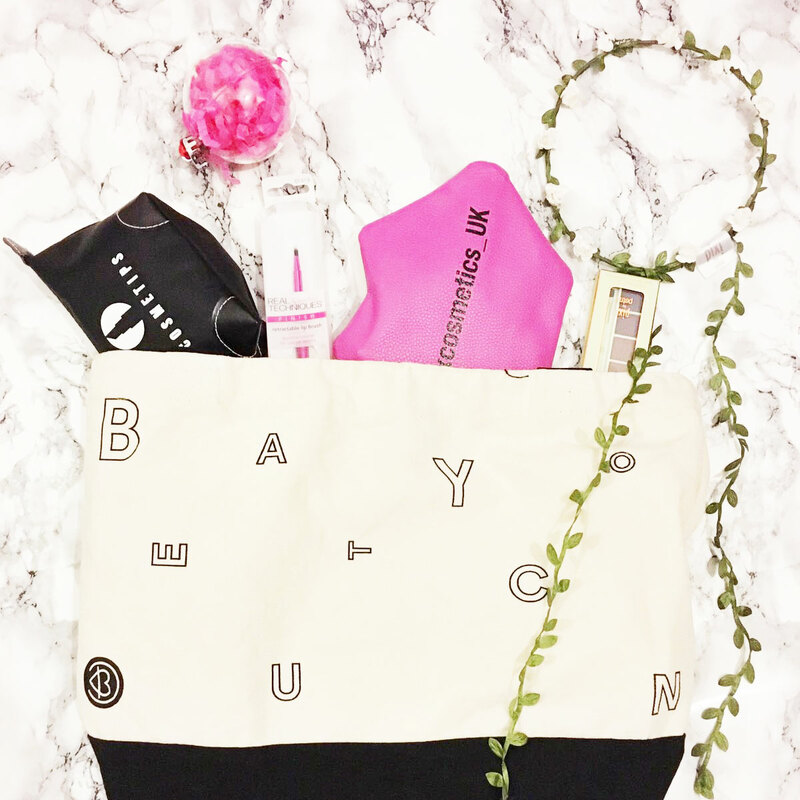 I am a big fan of Beauty bay and definitely a regular customer (just received two packages from them this morning!) and it was great to try products I had heard about but had never been able to sample here in the UK. 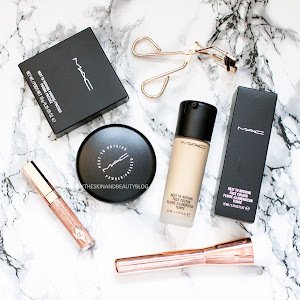 Unfortunately they didnt stock the absolutely beautiful Kevyn Aucoin sculpting powder which I absolutely must have now and they had the coveted Morphe 35o palette but unfortunately ran out of stock! The talks were great and empowering. I saw a few - the first One world, Many Hastags was chaired by Thandie Newton and Kay-Montano talking about the cross cultural connection that beauty had and was able to unite us globally. The second, The changing face of beauty, was chaired by the stunning Jay Manuel (yes my jaw dropped a bit when I saw him) talking about the power that Youtubers had and how the definition of beauty had changed and developed. It was quite inspiring. Lastly the absolutely gorgeous Suki Waterhouse and Poppie James came to talk about their new accessories line and how they had started their business. 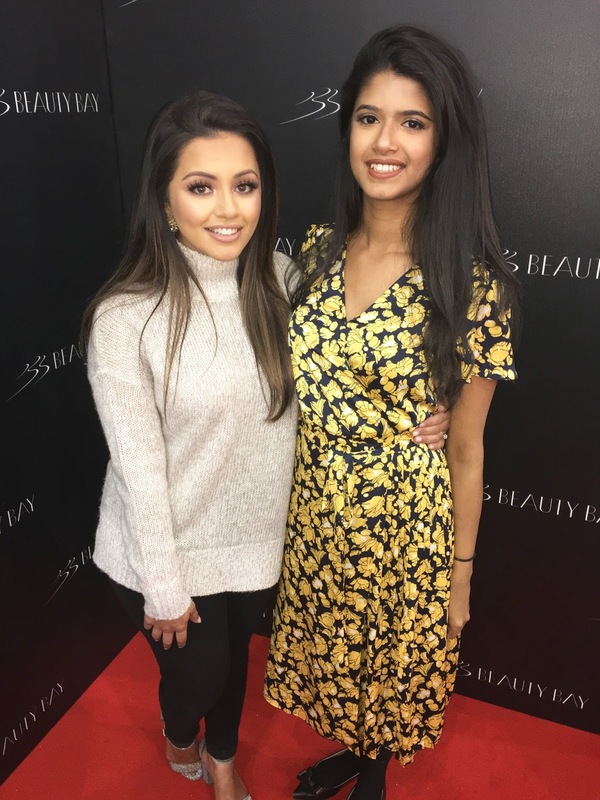 I also got to meet +Kaushal Beauty the famous youtuber! She was just as warm and lovely in person as she comes across in her Videos - and yes she is just as stunning! 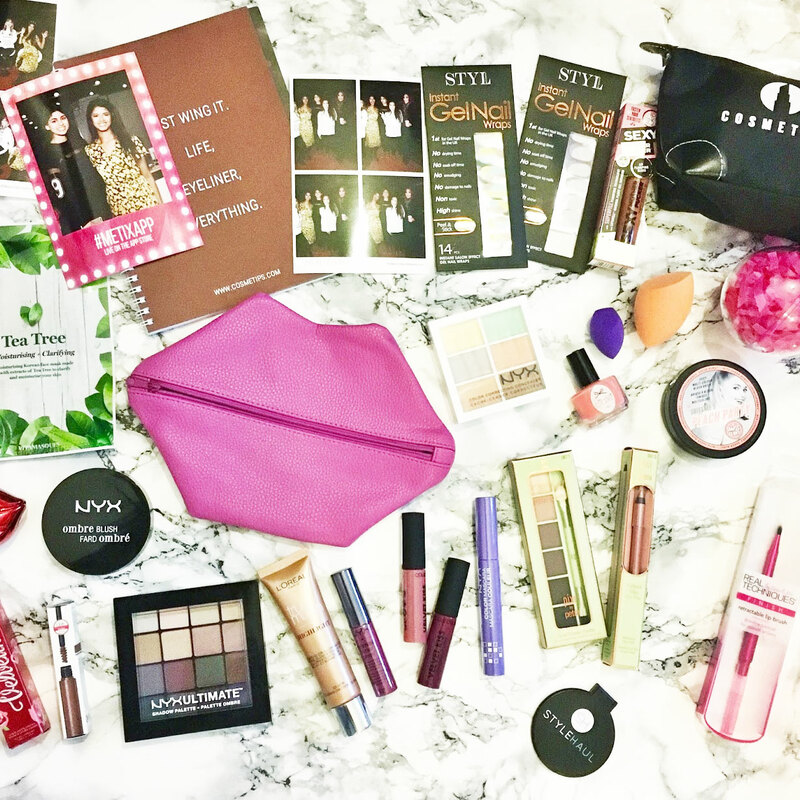 +NYX Professional Makeup had a spinning wheel and I was lucky enough to land on the star prize winning a cute lips bag filled with a lip butter gloss, a colour mascara and the beautiful eyeshadow palette down below. I had a wonderful time and will definitely be back next year! Did you also attend? What did you think? Leave a comment below! 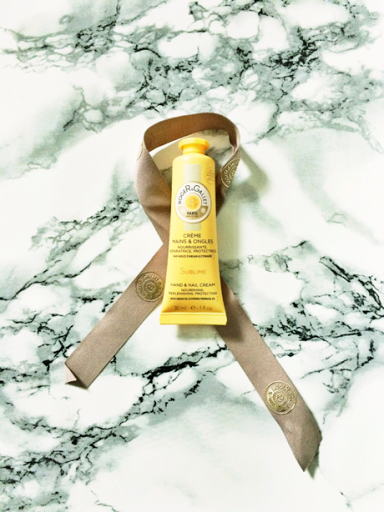 Roger and Gallet Hand and Nail cream definitely has a rich scented formula that is great for dry to very dry skin. Personally I would classify my skin as very dry and this leaves it feeling hydrated and perhaps even on the greasier side initially. The product boasts 8 hour hydration which I think is probably on the lenient side. However it is a very rich formula so I think would last longer than most. It contains Argan oil and evening primrose oil which are great for the skin. The packaging is cute and it's size definitely is very handy - great for on the go and to have in my pockets whilst on the wards! However, the scent for me is quite strong and overpowering. It's a bit of a marmite situation. There are hints of orange blossom which some may love however I find it somewhat artificial and over powering. Secondly, one other drawback is personally it irritates my skin. I unfortunately have extremely sensitive skin and although I'm not sure what ingredient it is causing this, this makes this product a Nono for me. Have you tried this product? I would love to hear your thoughts - please leave a comment below!